There are times when I get frustrated here in Botswana. I am supposed to be “building capacity” and doing sustainable projects. There is that old saying, “Give a man a fish and you feed him for a day, teach him how to fish and he will eat for a lifetime.” I am supposed to be “teaching how to fish” as the saying goes. Often the people in my office seem to only want me to “give them a fish”. They want me to do things for them and do not want to learn how. I am especially aware of the importance of teaching rather than doing, now that there is only about six months before we leave. Example… The District Aids Commissioner, Mma Mokoti, recently came to me asking if I would create an Access database of the VMSAC (Village Multi-Sectoral Advisory Committee) members. I had done something similar earlier for the DMSAC members. I reminded her that I would be gone in a few months and I did not want to create the database, instead I wanted to sit down with her or someone else and teach them how to. She seemed frustrated and never got back to me. I asked her about it a few times and finally I realized she was not going participate, so I went ahead and created the VMSAC database for her one day mainly out of boredom. Another example… In a meeting a few months ago Mma Mokoti told us that the District Commissioner wanted everyone to come up with an innovation, a new idea. She asked if I had any ideas. I suggested that we create a web page for the DAC office. It was received with great enthusiasm. I told them I would get the ball rolling but then one of them would have to be my counterpart and learn how WordPress works so they could step in when I am gone. Also, I said each of them would need to provide content and help design the web page, since it is their web page. Despite repeated reminders that we needed to get together — no one wants to do it. The most I could get them to do was give me the soft copy of information that I uploaded to the web site. At one point, Nozi, the assistant DAC flat out told me, “Rapula, you probably won’t get anyone to help you with the web page”. When I asked why, she said, “Aiish, we are all just too busy, and can’t you just do it?” (Believe me, they are not too busy.) While I waited for them to get back to me I kept adding things and ended up creating the web page myself. I have not given up though, I am still trying to get someone interested in learning how to maintain and update the web site. One of the biggest problems that gets in the way of building capacity in the staff is that they wait until the very last minute to do anything, then the day before something is due they ask me for help. In that case there is no time to teach them. I have tried to help them learn that life is a lot easier when things are planned way in advance, but the staff seems hopelessly committed to doing things in “African Time“. Recently something happened that gave me a much needed boost. I was at the District Admin offices and met a young woman named Beauty. Beauty is a college student working here as an intern for a few months. 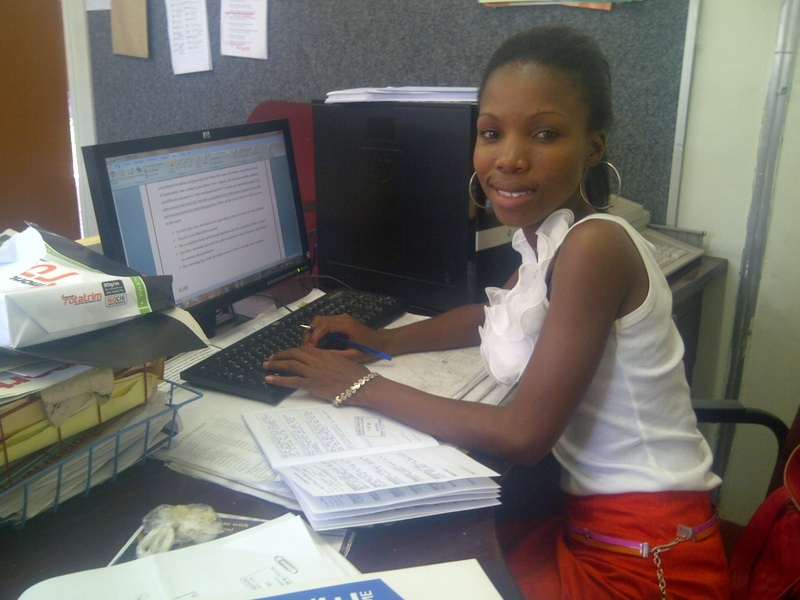 She is majoring in Information Technology with a concentration in networking at BOTHO college in Gaborone. The DA offices are in desperate need for an IT officer who will help the people there. I help out from time to time, but they need someone on site. I was hoping I could train Beauty to fill that role for the months she is there. We talked for about an hour and Beauty’s enthusiasm was refreshing. This was a young Motswana woman who really wanted to learn, she didn’t just want me to do her job for her. We met again a week later for a few hours. I shared with her some solutions to the most common problems people have with their computers at the DA offices. I taught her how to get rid of a very common virus in Botswana that infects memory sticks. I also suggested an anti-virus software whose virus definitions can be updated off-line, which is necessary since most do not have internet. I gave her some other software to distribute, including software to teach typing, and an off-line web browsing application. Beauty was very interested, asked many intelligent questions and really “got it”. In the following weeks she was loading the anti-virus and typing software on computers and had been using the other things I taught her. The project she was most interested in though, was creating a web page, similar to what I had done for the DAC Office. We had to go off-site for this project because there is no internet in her office. We met somewhere that had reliable internet and started work. I taught her the basics of creating a web page using WordPress and enjoyed seeing her soak it all in. We got the beginnings of the web page off the ground and I left it in her hands. I am hopeful that she will run with the project — time will tell. The future of Botswana is their youth. Beauty reminds me of so many intelligent, ambitious American college students I know. If all Botswana youth are like her, the country is in good shape. This entry was posted in Peace Corps, Service - Year 2 and tagged Botswana, Mobley, Peace Corps. Bookmark the permalink. Well said and precisely the same issues I see on a daily basis in Tonota. The last minute panic, rush job leaves no teaching time. Frustrating to say the least. Hope I get to meet a “Beauty” before I leave as well. I know that this must be frustrating to you. You must remember all the obstacles that you have overcome. When you leave I bet that what you have taught them will prosper. I think that they do not want you to leave because you have made their job a lot easier than before you came. No matter the culture people are people. Hang in there and things will be better before you leave.